Brits Flying Club celebrated their 60th Birthday, on Saturday 12 July by hosting a very well attended fly-in. The club was established in 1954 by Arrie Bolt, Ellle Bolt, Kosie Coetzer, Ben Habig, Pat Farrel, Charlie Allen, Bushy Meiring, Dennis Annandale and Doris de Wit on a piece of ground belonging to the Department of Agriculture. Two gravel runways were constructed 02/20 (950m) and 18/36 (840m) funded mainly by the founder members with some support by the Brits Municipality and the local community. The original open thatch roof clubhouse was also built this was later replaced by the existing clubhouse. The old clubhouse was converted into a flat which can be rented out. Brits today, one of the friendliest clubs around. Johannesburg Light Plane Club offered their support by supplying an instructor one or two days a week to satisfy the growing need for flight training in Brits, at that stage all training was offered in a Tigermoth, belonging to Arrie Bolt and a Chipmunk. After a long day of instruction the students and instructors enjoyed a braai and camaraderie and this tradition seems to have stuck, making Brits one of the most hospitable flying clubs I've had the pleasure to visit. As the membership grew the need for hangar space arose, two hangars were built, one of the hangar's roof trusses were constructed out of used granite “gang-saw” blades and this hangar is still in use today. The club became a social hotspot with the construction of a swimming pool and a clay tennis court which was used for many tournaments. In 1965 the Club decided to purchase their own brand new aircraft after long discussions it was decided that they would import a Piper Cherokee 140, a massive sum of R4700-00 had to be forked out for their new acquisition. ZS-FTB was sold in 1975 and replaced by ZS-ILC, a Cherokee 150 unfortunately she had to be sold due to financial restraints in the economic depression of 1977. 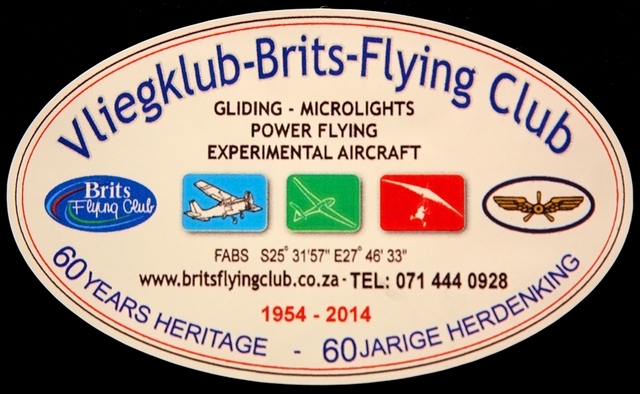 The economic challenges also led to the vertical crash of the club with membership dropping to only six, from being the biggest flying club in the Transvaal in 1968 with 58 active members and 9 resident aircraft. Frans Guba the chairman and committee members Bezuidenhout, Hans Schwebel, Fred Boshoff, Gerhard Gast, and Chris Forbes soldiered through the difficult years maintaining the airfield on their own account until 1988. 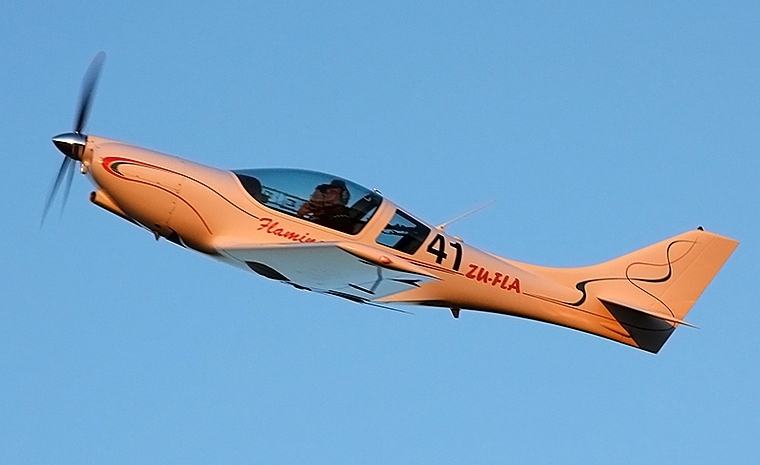 Brits Flying Club over the years have become home to many businesses and smaller specialised clubs these include Wings 'n Tracks the home of the Lambada, Flamingo, Samba and the Seagle light sport aircraft operated by Rainer and Barbara Frieböse, Tailwind Aviation a helicopter AMO. 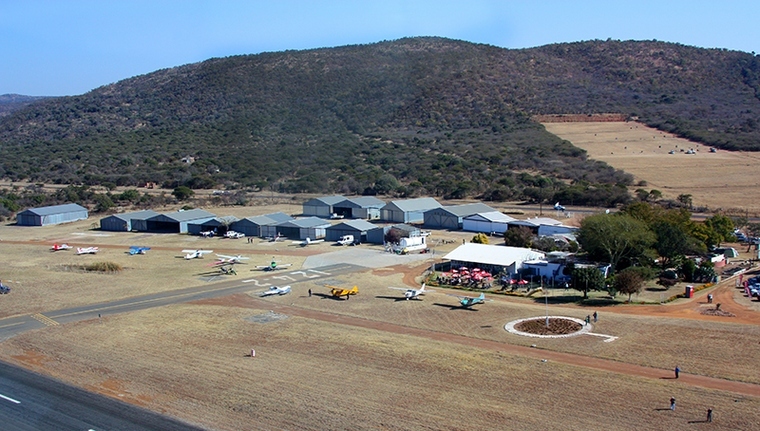 Kranskop Gliding Club was established in Brits in 1994 but later moved to Warmbaths only to return in 2001 and have made it their permanent home ever since. Brits has become very popular amongst the microlighting fraternity this may be due to the decision made in 2000 to welcome this type of aircraft when most registered airfields did not accommodate them. 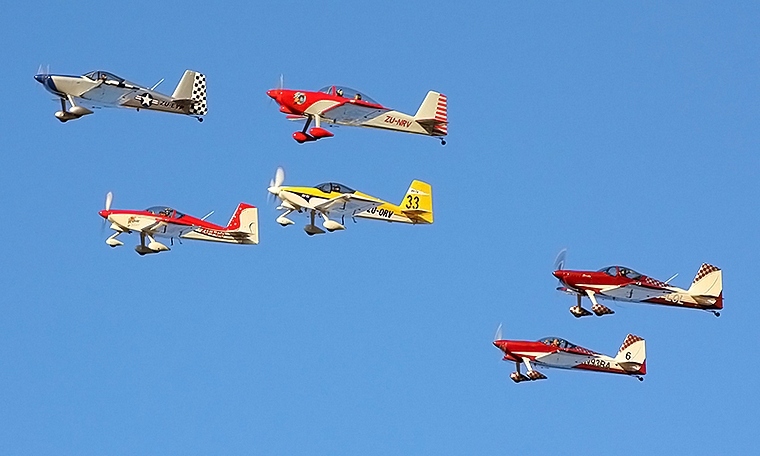 Well over 50 aircraft come from far and wide to celebrate with the Brits locals in wonderful bushveld style. 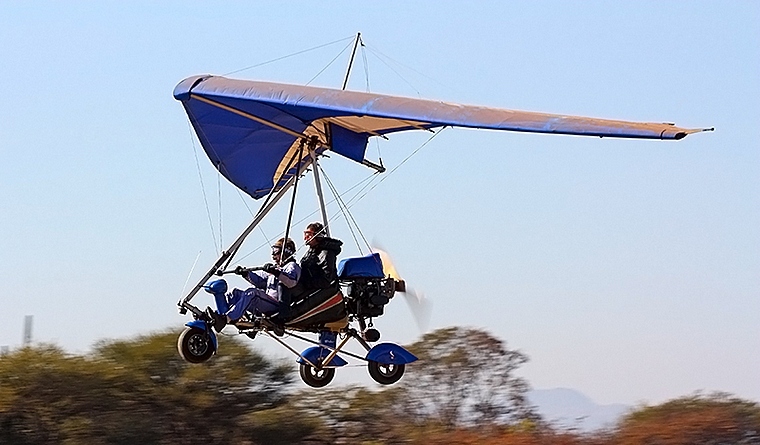 The first arrivals were as has become customary a “gaggle” of trikes flying in from many of the smaller airfields from Gauteng and North West provinces, followed by a large variety light aircraft and motor gliders. All arriving aviators and passengers were treated to a hearty breakfast in the clubhouse and lots of coffee to chase the winter morning chill. Karl Jensen chairman of the EEA's Chapter 322 flew in his wonderfully maintained Cesena 170.Karl kept the crowd entertained while various pilots took to the air with a range aircraft that would rival most country air shows. Bristell SA brought along their new BRM Bristell LSA one of only two in South Africa, Bristell SA are based at Rand Airport and are in the final stages of certification for the BRM Bristell and after being treated to a flight in this magic aircraft I am certain we will see many more take to the South African Skies soon. Thanks Ian and Christoph and I wish you great success with the new venture. The Chairman of Brits Flying Club, Roel Jansen treated many visitors to a flip in his Solowings Windlass Trike showing just how versatile manoeuvrable these little “scramblers” of the air are. The microlight contingent was also bolstered by the arrival of a Bat Hawk the upgraded version of the ever popular Bantam. Jeff Earl retired Air Force Colonel, previous owner of Placo and Chairman of Aero Club made the trip from Vereeniging in his immaculate Super Cub accompanied by his beautiful wife Sharlene. The Vans RV Team made a surprise visit and really enthralled all the present when they did a few circuits in very tight formation. The RV team have become regulars on the air show circuit in the last year or so. Their ability to fly tight manoeuvres in really close formation is fast becoming a major attraction. 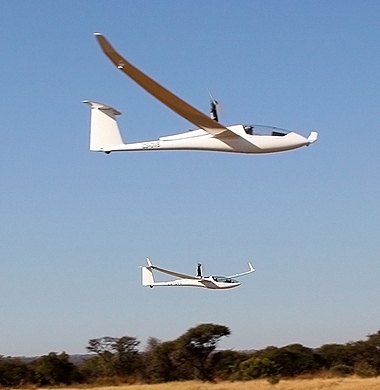 Members from Kranskop Gliding Club demonstrated a range of self launch, conventional and motor giders. Ranging from the veteran Schleicher K7 to the ultra modern hi-performance Glaser-Dirks DG-800 B Self Launch. A Robbie 44 and 22 joined by the wonderfully restored Sud Aviation Gazelle to make up the rotor wing numbers unfortunately no Gyro copters made it to the event. The day was topped off with a dinner for all the members and guests that stayed the evening. Overall the day was a great success with lots of old friends having a chance to get together and share some aviation memories. We wish Brits Flying Club a happy birthday and may they be around for many more years to come. Anyone looking for a destination for breakfast or just a cup of coffee Brits is definitely one for the list.